Cohdi Harrell is an American born performance maker. 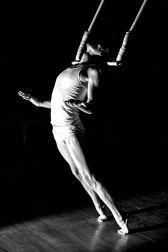 A primarily self taught trapeze artist and an untrained dancer, he uses contemporary movement, improvisation and spectacle performance to create intimate environments of jaw dropping poetics. His work has been featured on CNN, National Geographic and the New York Times amongst others. He is one half of the circus of two, Ricochet.